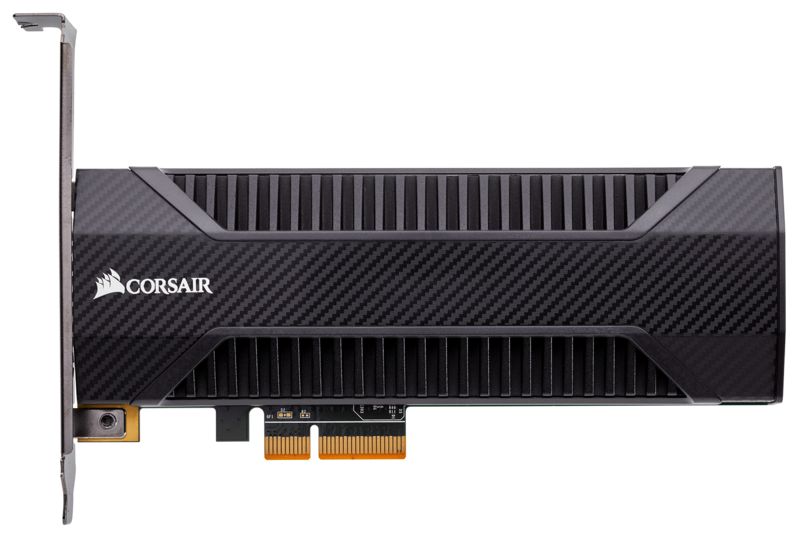 Corsair has started selling its highest-capacity PCIe SSD to date, the Neutron NX500, featuring 1.6 TB of NAND. The drive is based on the Phison E7 controller as well as Toshiba’s MLC NAND, so it is going to appeal to those seeking for a proven MLC-based storage solution with loads of flash memory reserved for over-provisioning and a five-year warranty. It should be noted however that with big capacity comes a big cost. The new Neutron NX500 1.6 TB is an HHHL card, just like the versions with 400 GB and 800 GB of usable memory. From an architecture point of view, the Corsair Neutron NX500 SSDs are similar to the Force MP500 drives launched this time last year: they are powered by the Phison PS5007-E7 controller, use Toshiba’s MLC NAND memory made using a 15 nm fabrication process, and have a PCIe 3.0 x4 interface. The general feature set of the E7 controller is also well known: it has four compute cores with eight NAND channels, supports error correction with 120-bit/2KB BCH code (that is good enough for planar MLC NAND), the NVMe 1.1b protocol with the NVMe L1.2 power saving mode, end-to-end data path protection, advanced global wear-leveling and so on. 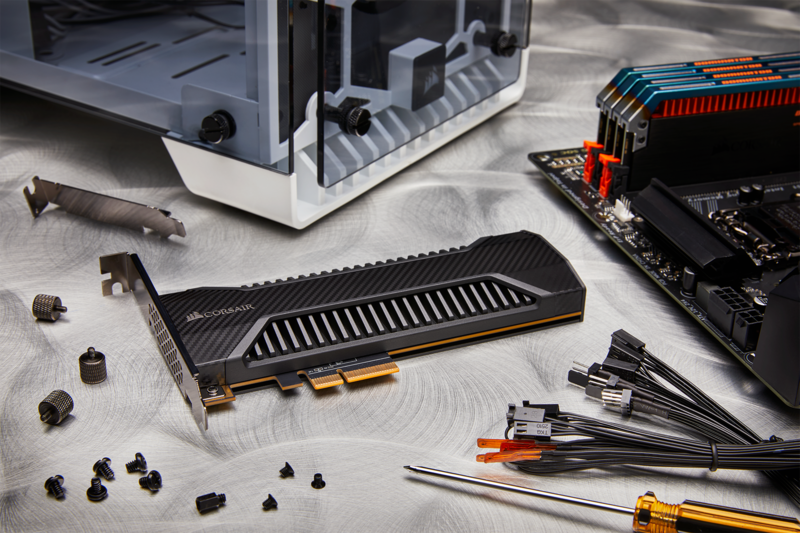 When it comes to performance, everything is by the numbers: the drives are rated for a sequential read speed of up to 3000 MB/s, and a sequential write performance of up to 2400 MB/s. Because the Neutron NX500 SSDs use Phison’s latest firmware, they can perform up to 300K random read IOPS (input/output operations per second) as well as 270K random write IOPS, which is considerably higher than the random performance of the MP500 and some other E7-powered products. The key features that differ the Neutron NX500 from the vast majority of drives featuring the Phison PS5007-E7 controller are the add-in-card form-factor as well as usage of large amounts of NAND flash for overprovisioning to guarantee long-term reliability and performance. The Neutron NX500 carry 512 GB, 1 TB and 2 TB of raw NAND flash memory, but users can access 400 GB, 800 GB and 1.6 TB of NAND, depending on the model. With massive amounts of memory used for overprovisioning. 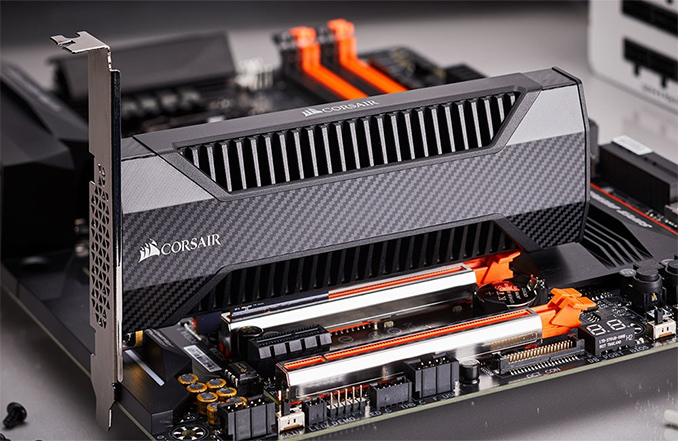 Corsair offers them with a five-year warranty, which is not that common these days, compared to the 1-3 years given with most M.2 drives. The huge amount of MLC NAND for overprovisioning has a knock-on effect on the pricing of the Corsair Neutron NX500 drives. The configurations featuring 400 GB and 800 GB of NAND flash memory were launched earlier this year at $319.99 and $659.99 in the U.S., respectively. The 1.6 TB configuration became available at Corsair’s online store this week at $1575 in the US, €1770 in the EU, and £1615 in the UK. If the form-factor and overprovisioning are clear advantages of the Neutron NX500 1.6 TB, then its high price point (conditioned by MLC NAND) is its main drawback. The final cost of ~$1 per end-user visible gigabyte is rather high for a consumer SSD in late 2017. Corsair’s product is available for $1633 at Amazon, a bit cheaper than Samsung charges for its 960 PRO 2 TB drive ($1641), but with obviously less immediate capacity. On paper, the Samsung 960 Pro is faster than the Neutron NX500, which makes the former not only cheaper on a per-GB basis, but also more preferable for general use. However, the Neutron NX500 is rated for 2793 TBW, whereas the Samsung 960 Pro 2 TB is rated for 1200 TBW. Typically, SSD makers set rather conservative TBW targets different from the real world endurance, but if one only considers “official” TBW ratings, then this is where the Neutron NX500 1.6 TB excels the Samsung 960 Pro 2 TB. "a bit cheaper than Samsung charges for its 960 PRO 2 TB drive"
They need to get in the ~500gb range for at most $225 USD no matter the company. SSD/Flash or whatever is nice to have for the speed, but, it does not really seem like the prices are going down very much, just the size/speed/cost going UP. X per gb, I think for performance/capacity 500-525gb is a sweet spot for performance/life/cost. I kind of prefer the standard drive form factor, a bit more durable, tends not to throttle due to heat issues, can be used in pretty much every system, and do not block the case much. anyways..seems the performance of these are ok, but, like almost all "modern" styles, the price, not so much IMO. Biggest problem with these drives is you're out a lot of money if one fails. I've switched to multiple 1TB drives as Samsung doesn't provide the claimed warranty coverage, and losing a 2TB drive really hurts the pocket book.